See all that Hot Springs has to offer you with this perfectly simple and fun 2-day journey through the biggest and best Hot Springs attractions. On this trip your group will be able to zip through the treeline of Arkansas, see some of the best hands-on museum activities in the state, and even splash around on some very unique Bumper Boats at Fun Trackers Family Park! Spend your morning at a native botanical garden and spend an afternoon riding thrill rides at Magic Springs, this trip is a fun-lovers paradise! Adventureworks Zip Line Park - Adventureworks Zip Line Tours is an exciting aerial adventure park in Catherine’s Landing near Hot Springs. This thrilling zip line park offers your group an unbelievable adventure with a bird’s eye view of the beautiful native Arkansas forest filled skyline. Your group will soar through the open Arkansas air on steel cables, secured in a safety harness and attached to a strong zip pulley system. This track in particular is made up of 12 zip lines and over a mile of adventure. Some of the guests favorite parts of this adventure include the water dip above the creek, the 50 mph race section, and the famous Sky Bridge. The Big Sky Bridge takes you across a creek below to an 80 foot observation tower built around a giant oak tree. Get ready to cross flying off your bucket list, as you and your group have the time of your lives on this incredible aerial adventure! Purple Cow - The Purple Cow is a family-friendly, '50s themed diner that serves as Arkansas’ spot for "the young of all ages." The aptly named to fit the decor Purple Cow was founded in 1989 and has since then turned itself into a beloved eatery with a commitment to quality food and terrific service. The dining area provides a family-friendly atmosphere, fantastic staff, and out of this world classic Americana food! Once inside you will see the intricate details of how this restaurant is modeled after a classic 1950s diner, keeping true to the American diner vibe - plus a whole lot of purple! The restaurant is famous for its hand-dipped shakes and gourmet burgers, but there are also other delicious items on the menu such as chili and daily-made soups, fresh salads, deli-style sandwiches, and even beer and wine! There is something for everybody in your group here to eat, and even look at! Mid America Science Museum - Welcome to Arkansas’ largest hands-on science center, as well as the first Smithsonian affiliate in the state, the Mid America Science Museum. Here your group will find over 100 engaging hands-on exhibits that cover the wonders of energy, matter, life, and perception. This museum seeks to spark curiosity and enhance scientific understanding through inquiry, observation, and discovery. Some of the most fun exhibits that have been drawing a crowd since its opening are the informational Arkansas Underfoot, high flying and exciting Bob Wheeler Science Skywalk, and the expansive Oaklawn Foundation Digital Dome Theater. All of these exhibits will show your group the basic concepts of physics through wave motion, kinetic energy, and gravity. When your group is done playing around be sure to stop at the Creek Walk Cafe for some lunch or head outside to enjoy the beautiful wooded park and picnic areas! Fun Trackers Family Park - Fun Trackers Family Park is the number one choice for first class family fun for tourists and locals alike in Hot Springs and has been for over 15 years now. 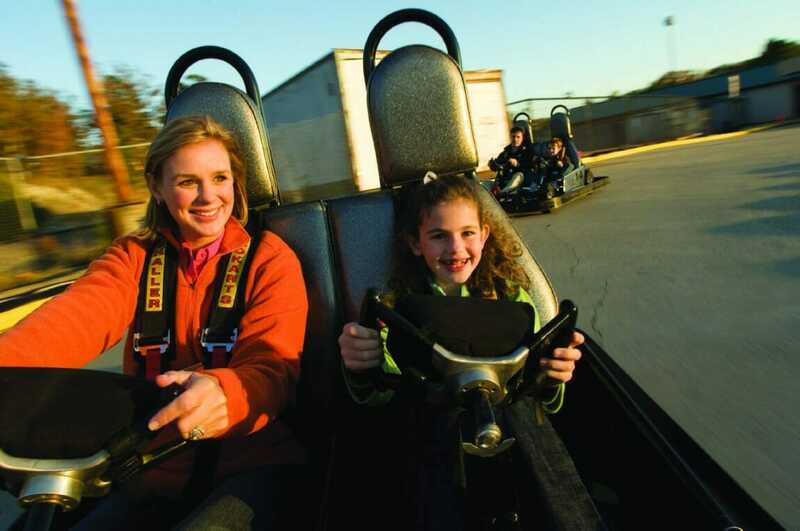 Owned by Rick and Lisa Crispino and sons, this Arkansas must-stop destination will give your group thrills, excitement, and fun abound at the largest and fastest go-kart track in the state, a new state-of-the-art addition to the park that is drawing in happy customers left and right! Not only can your group enjoy a truly heart-pumping turn on the fastest drift go-kart track in the state, but you can also splash against each other at the highly popular Bumper Boat attraction! The Bumper Boats are a great way to cool off in the hot Arkansas’ summer, the area shaded by palm trees and sprinklers! After that you can go play some golf at the adjacent 18-hole mini-golf course or choose to go inside to the all-new arcade and game room for some serious gaming or relaxation! Garvan Woodland Gardens - Welcome to Garvan Woodland Gardens, the 210-acre botanical garden off the shores of Lake Hamilton nestled within the scenic Ouachita Mountains. Garvan Woodland Gardens features one of the top 10 ranked Japanese Gardens, excellent seasonal blooms, and hundreds of thousands of plantings throughout the location. This garden is also home to many architecturally significant structures, such as the wood and glass Anthony Chapel. This botanical garden is an example of the Natural State at its best, inside showcasing a canopy of pines reaching skyward providing protection for delicate flora and fauna below. You may explore the 4.5 miles of wooded shoreline, taking in all the trees as you listen to the gentle lapping waves of Lake Hamilton. While here your group will have to see the Bridge of the Full Moon, Daffodil Hill, Dooley Pergola, and the beautiful Garden of the Pine Wind. Magic Springs and Crystal Falls - Get ready for some good old fashioned family fun at these two sister parks, Magic Springs Theme Park and Crystal Fall Water Park. There are over 80 attractions in Magic Springs, the only theme park located within a beautiful national park. While here your group will have the chance to let loose and ride some serious roller coasters, some of the most popular including the Arkansas Twister, the Gauntlet, the disorienting X Coaster, and the thrilling Diamond Mine Run. For more of an exciting ride head over to the Wild Thang or The Hawk! Crystal Falls water park is where the crowds flock to beat the summer heat, home to the most fun water rides in the state. Crystal Lagoon has three body slides, four tube slides, a lagoon, and a extremely fun 1,000 gallon bucket that drops water on guests every 10 minutes! Once your group has had enough fun (like that’s possible) head over to any of the grills, cafes, or concessions for some delicious food. Timberwood Amphitheater - Located with Magic Springs you will find the Timberwood Amphitheater, the premiere place in Hot Springs to find the best summer concerts nightly! On this stage you will see high-energy performances by top artists across a variety of genres, sure to please almost everyone in your group! In the past Timberwood Amphitheater has seen excellent performances by 3 Doors Down, the Charlie Daniels Band, Scotty McCreery, and the Newsboys, as well as the most recent performers Brett Michaels and Hunter Hayes. The annual summer concert series brings in a large crowd, from locals who have wanted to hear a band for months to tourists who bought a ticket while cooling down at the park! Enjoy this awesome outdoor concert venue, the perfect way to end your trip to Hot Springs!